If you haven’t heard of Marie Kondo and her hit Netflix show yet, get ready to re-evaluate your cleaning style, organizational techniques and possibly your life as a whole. Marie Kondo is the master of de-cluttering, and her best-selling book has helped thousands of people adopt a more minimalist and healthy lifestyle. Using the same philosophy, Marie’s methods can also turn the most disorganized traveler into a sleek and unencumbered globetrotter. If you’re tired of paying extra baggage fees and want to start traveling lightly, check out these great tips for packing that are inspired by Marie Kondo’s philosophy! Marie’s method for tidying involves finding items that spark joy for their owners. In that same vein, you’ll want to travel more and look forward to packing if you pick a suitcase that makes you feel happy when you see it and use it. You’ll want something beautiful, but also functional and sturdy so you can enjoy it for years to come. It can even serve you well in the future to find a suitcase that complies with most carry-on restrictions. You’ll save yourself the extra check-in fees. Take some time before your trip to think about what you need and why you’ll need it. Plan out your activities and check the weather for each day so you’ll know what clothing or gear is absolutely necessary. Where you can, reduce some of the items or try to bring things that can be reused. 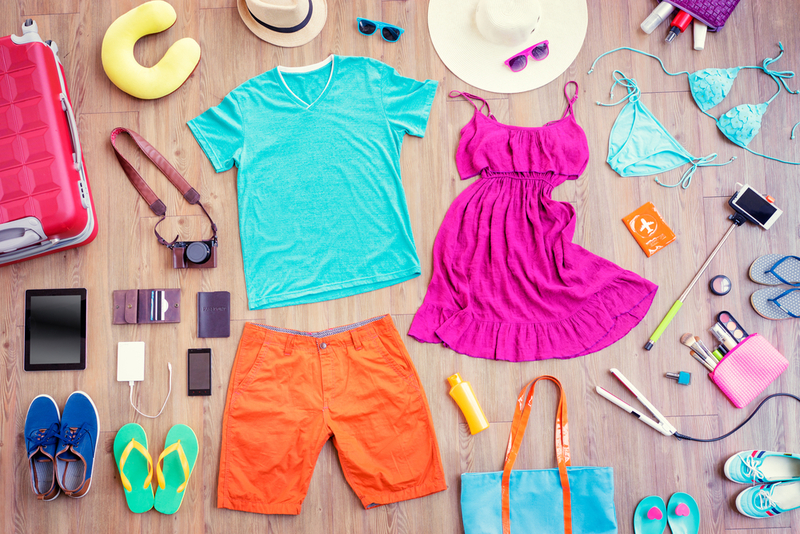 Outfits that can be mixed and matched for different occasions and products that can be used in a multitude of ways are best suited for traveling. Then once you’ve narrowed down exactly what you’d like to bring, lay all of the items out in front of you to visualize how it should be sorted into your suitcase. Marie has an entire chapter devoted to folding, so you know it’s important. Most people fold their clothes and place every item on top of each other in their suitcase, but Marie recommends folding in such a way so that the items stand up next to each other side by side. This way, you can easily see (and grab) what you want without rummaging through and destroying your entire suitcase. If you are bringing clothes that wrinkle easily, roll them up like sushi instead of folding to prevent creases, but still stand them upright and vertically for easy viewing. Marie has a plethora of space-saving hacks, such as utilizing the empty space inside shoes to pack jewelry or stuffing socks into bra cups. She advocates the use of pouches or other small packing cubes to keep similar items together and safe from damage. She also suggests saving toiletries for last and packing them in their own water-proof containers to prevent a suitcase catastrophe. You never know what items may “spark joy” for you on your trip, so save some space in your bag for any must-have souvenirs. Having some breathing room in your suitcase also makes it much less stressful when you’re packing up to return home and don’t need to sit on the suitcase to get the zipper closed! Check out Marie Kondo’s show and book to bring her philosophies into your everyday life and get all the tips from the genius herself!